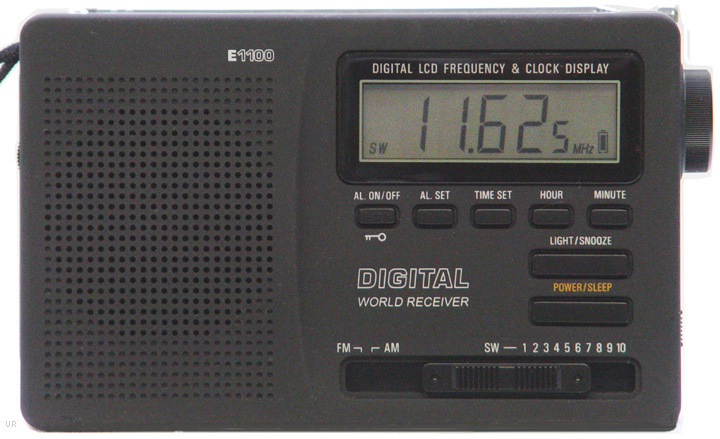 The Lextronix E1100 keeps you in touch with both local and international news where ever you go. This compact radio receives AM, FM and ten shortwave bands. Shortwave coverage is: 3990-4440, 4680-5260, 5920-6610, 7015-7730, 9160-10130, 11590-12500, 13530-14200, 15060-16000, 17380-18200 and 21560-22140 kHz. 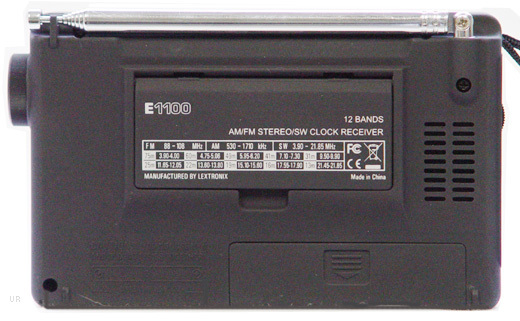 The E1100 is easy to use with an analog tuning knob on the right side of the radio. It features a digital display, lock function, radio or buzzer alarm, 24 hour clock, sleep function and stereo headphone jack. The backlit activates anytime you rotate the tuning knob. There is a flip-out tilt stand on the rear panel. The E1100 comes with a protective pouch, manual and wrist strap. There is a wall adapter jack 3VDC [] 100 ma (the wall adapter is not included). Black rubberized case. 5.12 x 3.15 x 1.15 inches 7 oz.